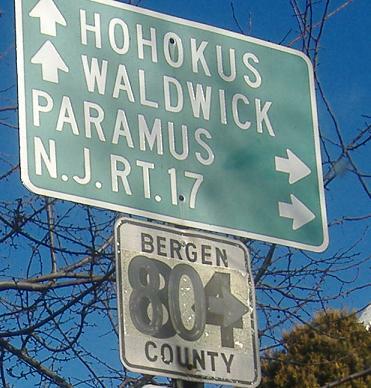 Two signs are missing - this is in fact EAST NJ 7, and SOUTH CR 507, just after their multiplex begins. Looking north at the NJ 3 drawbridge, which looks a lot prettier from the ground than when you're stuck in Meadowlands traffic on top of it. 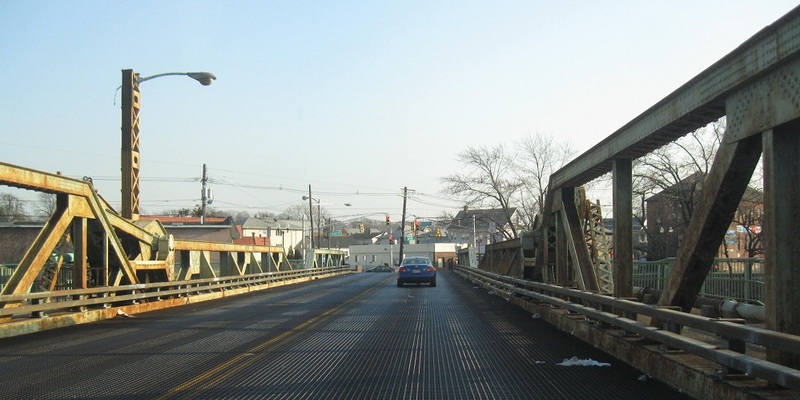 Wallington Ave. WB from CR 507/Locust Ave.
NB at the 8th St. bridge, the easternmost of the 3 Wallington crossings to Paterson. NB at and past Locust St. in Elmwood Park, with the latter photo courtesy Chris Eddie Wilson. 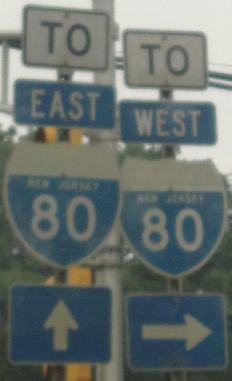 The undersized "20" shield was temporary, as a result of construction around the I-80/NJ 20 interchange that closed some ramps there. 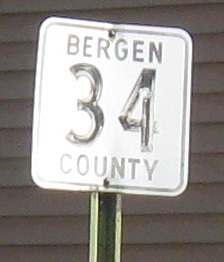 Now southbound, even older, original state-name shields at Market St. (original US 46 back in the NJSHR 5 days, visit the Market St. page below to see that). 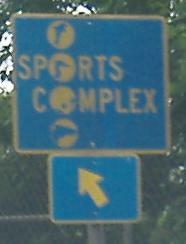 The Sports Complex standalone shield is extremely rare, dating from when the Meadowlands opened (before it became popularly known as that) and pointing to Locust St. and the I-80 EB onramp. 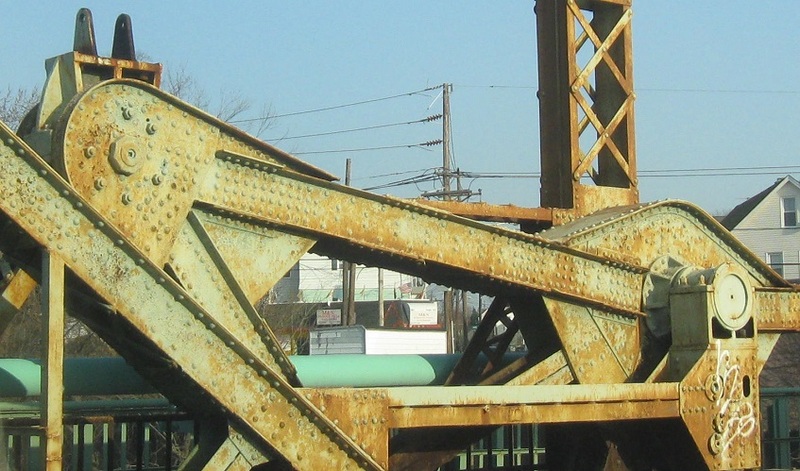 NB at the NJ 4 bridge over the Passaic River into Paterson, where it ends at NJ 20. 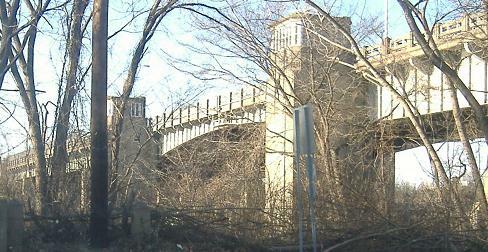 Two SB views of the bridge. 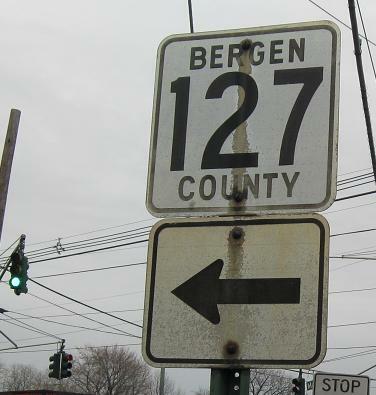 Enjoy these Bergen County shields on CR 127 (Harristown Rd.) 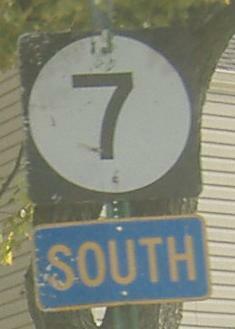 WB at CR 507/NJ 208 and CR 507 SB at CR S-79 (Prospect Ave.). 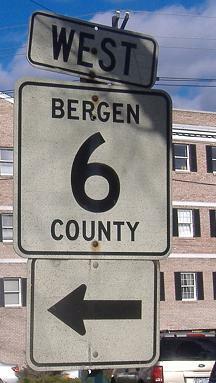 Bergen County half-heartedly assigned a number of low-numbered routes in a rough grid pattern, many of which exist in pieces and almost all of which make a number of turns and are multiplexed with other routes of normal numbers (higher than 25). 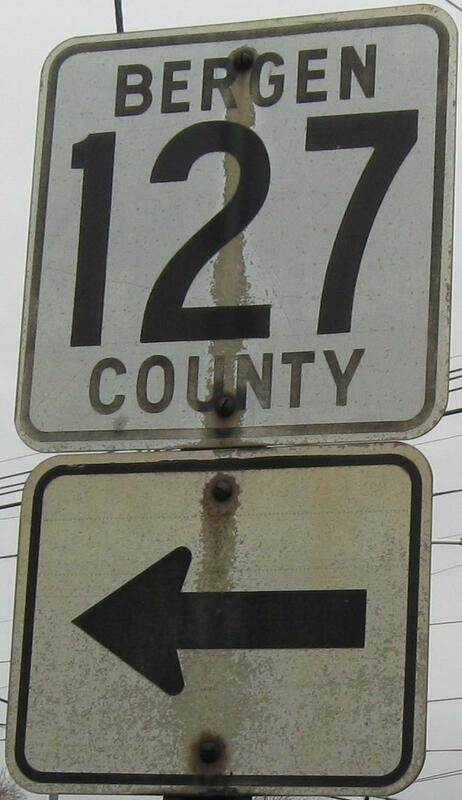 Click the CR 127 shield for closeup. If you like Bergen County shields, rejoice, because you get three for the price of one! This was originally a CR 84 shield, and at some point it turned into a CR 80 shield plus directional arrow. I've never otherwise seen an arrow inside a Bergen County shield, so I don't know what to make of that. Whatever was patched over the 84 didn't last too well, but I'm pretty sure there was something patched over the 80 as well. Why do I say that? Southbound instead of northbound (this is at Ridgewood Ave. in the center of Ridgewood), this shield is in fact a 6 patched over something, very possibly an 80. CR 6 now jogs over from Franklin Ave. a block to the north via CR 507, but according to the New Jersey Straight Line Diagrams, there is no such thing as CR 6, never mind what's signed in the field. In fact, both Franklin and Ridgewood are part of CR 80 - and part of CR 6 at the same time. 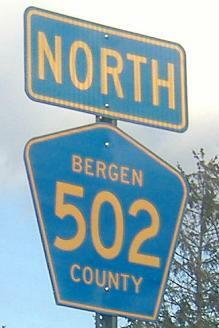 Bergen Co. assigned CR 6 to run east-west across the county, and much of its journey is spent on CR 80. I guess both numbers are correct, but you won't see a CR 80 shield for the entire concurrency. Now heading north to Franklin Ave., this shield is very much original with no patches. CR 507 turns onto the Franklin Turnpike, a large piece of which is former NJ 17. As you will see, CR 507 ultimately ends at US 202 at Suffern, NY, and if you continue into Suffern you'll find NY 59 (former NY 17 - in fact, due to 17 being moved onto the new quasi-freeway alignment to the west (including a piece of the New York Thruway), both 59 and 202 turn at this intersection, instead of the original configuration with 202 turning east and 17 continuing north. First of all, let's get this straight - 502 has an even number, therefore it's east-west. (Even the state routes aren't this well organized.) Just because it multiplexes with a north-south route doesn't mean it takes on that designation. Second of all, the second photo was taken MILES north of that multiplex, meaning it really should be a 507 shield. This is one of the more incomprehensible gaffes I've found. 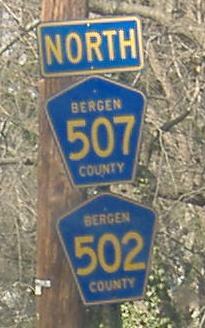 Lake St. WB in Ramsey at CR 507, the lowest-numbered county route in Bergen. Technically, this is the end of CR S-81 and the beginning of CR 87, but CR 2 is sort of an overlay on those roads. It gets more confusing when they're signed together or signage alternates. 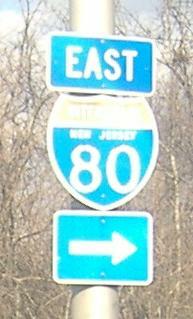 One of many old US 202 shields in the area, NB at the end of 507 and the end of NJ as well. 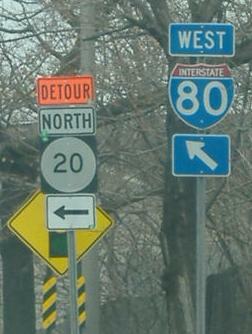 US 202 heads left underneath a trestle into New Jersey, while US 202 also heads straight into New York. Trucks unable to clear the trestle use CR 507 for a bit, presumably to Ramapo Ave. 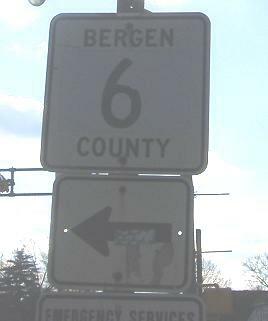 Given that all these old 2-digit shields are on county-maintained parts of US 202 (Bergen and Passaic Counties), I wonder who originally erected them, the counties or the state.